bullnose-welcome to china marmoglass, nanoglass, nano crystallized glass panel crystallized glass panel,crystallized white stone,white marble,minicrystal stone. 3. L/C 30 days from BL date. 1.Bigger and more profit : nanoglass is still the newest high-tech and high-grade decoration materials in the luxury decoration architectural world., and cause its excellent functions with better advantages of physics and chemistry than natural stone slabs. It became more and more popular . 3.A widely use. nanoglass can be widely use in the interior or externawall tile , floor tile ,wall cladding , counter top, vainty topand ,table top , water basin ,column, pillar and arc panel.also. The Nano crystallized Glass Panel (nano glass) not only has all advantages of the no pore crystallized glass Stone without air pore, but also avoid the problems of easy breakage in cutting and use existing cause for its Nano molecular structure. This new product becomes the true stone, which is harder in texture and better in quality. It is more pure white in color, higher in strength, harder in hardness and fargoing in use. Besides, it has no chip, crack and breakage in the processing, which is a good product for you to choose and promote. 02.Densely structured with no porous, zero water absorption, no ink, tea ,cosmetics can penetrate. 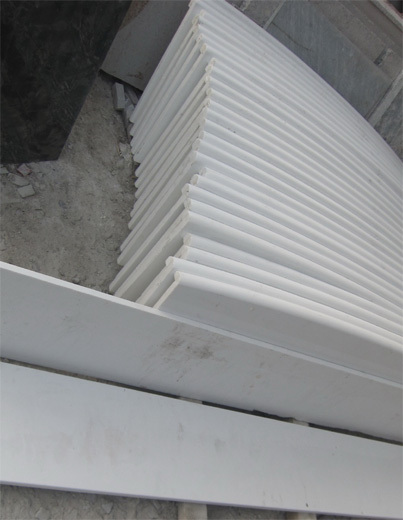 04.Superior strength in surface, toughest 05.Everlasting brilliance with superior erosion resistance and weather resistance, either at interior or exterior applications. 07.High temperature resistant, heat shock resistant,Anti-bending, anti-pressure, anti-shocking, wear resistant,perfect for kitchen counter tops, table tops, dinner table tops .